When temperature drops, wind blows and snow hits, an overcoat becomes an essential part of winter wardrobe. Besides, providing warm protection against unfavorable weather it also forms a classic piece of man’s wardrobe giving you fashionable and modish look. 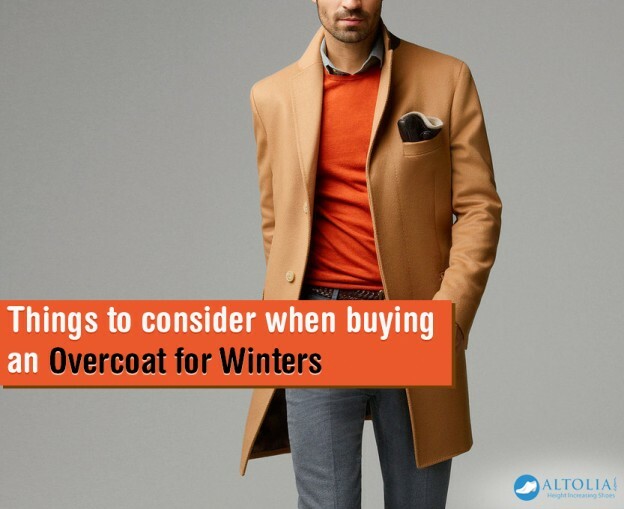 Length: Foremost thing to consider when buying an overcoat is length. Commonly overcoats come in two lengths-full length or knee length coats and ¾ of full length. As a rule, men of shorter stature look good in short, waist length coats or ones that rest around hips whereas a full length overcoat looks great on men with tall frame as it visually compensates with excessive height. Fabric: In terms of fabric, cashmere and wool are the best options for coat. Cashmere coats are warm, fashionable, durable but come with a heavy price tag. Cashmere and pure wool coats are stylish, soft and warm. Refrain from buying coats with synthetic fibers as they don’t allow your body to breathe and causes lot of sweating. Style: When it comes to choosing the style of overcoat you need to be selective as it reflects your personality while some jackets give you a trendy, action guy looks while others scream class and business. In the same way, double breasted overcoats are little formal whereas single breasted over coats give an all-rounder look. So when picking a new overcoat goes for a style that compliments your look and overall persona. Fit: A coat with a great fit adds to your personality. So when you are buying an overcoat always try it when you are wearing a shirt or at least a suit jacket underneath as the coat has to fit on top of your attire. When giving it a trial, you see any wrinkles appearing then it is definitely too tight for comfort. On the other hand, it depends on your personal liking also such as some men prefer a looser fit whereas other are more confident with a trimmer fit. So when doing your winter overcoat shopping, these tips will come handy.